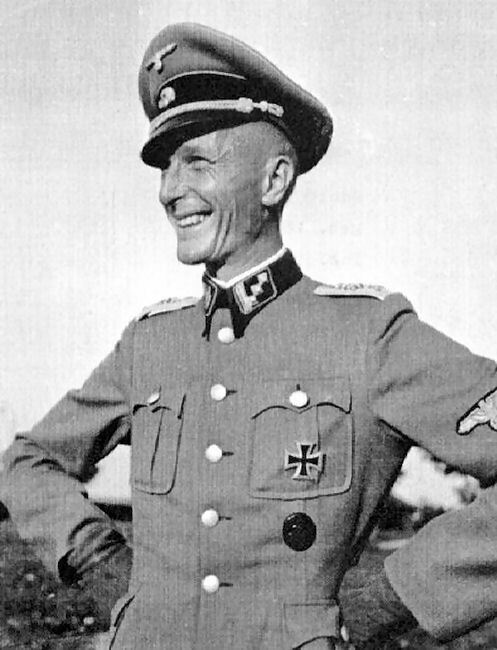 Adolf Rudolf Reinhold Diekmann (the man who led the attack on Oradour-sur-Glane) as a Hauptsturmführer. I have no date for this photograph, but it must lie between 20th April 1942 when he was promoted to Hauptsturmführer and 20th April 1944 when he became a Sturmbannführer. Given his light uniform dress and his generally smart appearance, my best guess is that this photograph was taken during the summer months, whilst he was acting as an instructor at Bad Tölz. He is wearing the Iron Cross, which he won in both 2nd and 1st class. It was a fashion with members of the Nazi party and the SS, to shave the sides of the head, so as to accentuate their Nordic appearance. Contrary to what many people have thought, he does not look 'mad' or 'bad', just a normal pleasant man with a nice smile. Take away the uniform and you would not think him anything extraordinary. When I think about Adolf Diekmann, I am reminded of the November 1971 song by The Who, titled, "Behind Blue Eyes" and I wonder if the sentiments expressed in it, applied to Sturmbannführer Adolf Rudolf Reinhold Diekmann after his actions at Oradour-sur-Glane on 10th June 1944.